The Uruguay and former Liverpool superstar was unveiled at FC Barcelona’s Friendly match on Tuesday. Luis Suarez , despite his outstanding performance for Uruguay at the 2014 World Cup, was best known for his controversial biting scene against Italy’s Giorgio Chiellini and his lengthy suspension. Yet, FC Barcelona insisted on their pursuit of former English Premier League’s top scorer and Player of the Year to land the striker in a £75 million deal with Liverpool during the Summer. Suarez, who is suspended until October from all official matches, was unveiled by FC Barcelona in a presentation to the fans on Tuesday in a ceremony that was overshadowed over his biting incident. It did not take the media too long during the press conference before asking him about his suspension and biting incident. 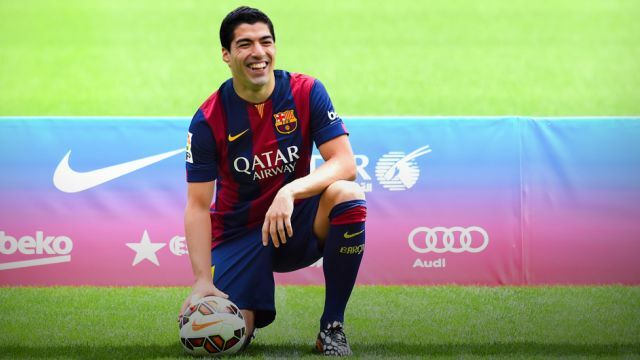 Luis Suarez however, for the first time, pledged to “no more biting” in upcoming season at La Liga. ”I say to all the fans, don’t worry, because I won’t do that anymore,” the former Liverpool striker said. The lengthy suspension will effectively rule him out of the first eight Spanish league matches and three of Barcelona’s six Champions League group stage matches. Suarez also remains banned for Uruguay’s next eight competitive matches and will miss next year’s Copa America and some World Cup qualifying matches. In terms of tactics, many pundits have questioned the need for third striker competing for a role on the pitch, while Barcelona already enjoy the goal production of Lionel Messi in particular and also Neymar. However, if Suarez keeps his words and avoid another biting controversy, considering his immense scoring impact at his former teams, Barcelona may soon become an unstoppable attacking force that La Liga and the Champions League opponents can hardly reckon with.